Family cottages are a joy, but passing the beloved home on to the next generation can give rise to many problems. Multiple owners means sharing time and expenses and with each subsequent generation the owners increase as do the problems. Some of the family may not be able to use or afford the cottage and may want to sell while others want to keep the treasure in the family. Traditional means of passing the cottage on the children usually means that the new owners are tenants in common and that one owner can force the sale of the cottage often resulting in the loss of the cottage to the whole family. 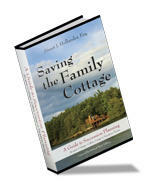 The book Saving the Family Cottage by Stuart J. Hollander, a lawyer from Traverse City, is an invaluable tool in developing a plan for an orderly transition of the family cottage from one generation to the next. Mr. Hollander presents various scenarios for passing the family cottage on and describes the potential problems that are likely to arise in a clear and concise format. His suggestion is to form a limited liability corporation (LLC) at minimal expense that would provide guidelines for time sharing, renting, in laws, buyouts of family member, sharing of expenses and other problems that may arise with multiple owners of a cottage. In the book, he describes several ways of dealing with all of the above problems and emphasizes the flexibility that an LLC gives the family in solving those problems. By proscribing how situations are to be dealt with, family arguments and wedges between family members are avoided. The LLC can be altered as new situation arise by consent of the new owners and even that process can be proscribed. The book is $19.85 and is available from Pleasant City Press, P.O. Box 490, Suttons Bay, Michigan, 49682 and can be obtained on the internet from www.cottagelaw.com. For those looking to keep the cottage in the family and avoid potential problems the book is a must read.